There are a variety of ways you can use a fleece blanket to create a blind, stop a draft, or repurpose the fabric to make other things. 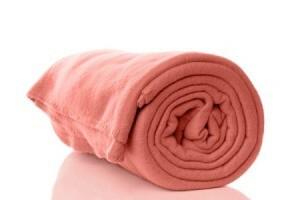 This is a guide about alternative uses for a fleece throw. I received a nice fluffy fleece throw, but it it too warm for me. How else can I use it? If you have a closet to cover, or a window you keep getting drafts through, pushpin this over it. If you want, get binder clips and evenly space them. Then, get shower curtain rings and thread the clip rings through them. and slid a rod through the rings. You then have a nice curtain. This is one I won a contest for. Donate to homeless shelter; blankets are always welcome! Fleece doesn't ravel. So if you'd like, you can cut it into strips and make winter scarves. Frankly, I like Janet's idea to use it to add color and texture in your home. The foot of the bed is a popular place to display something colorful or over a chair.